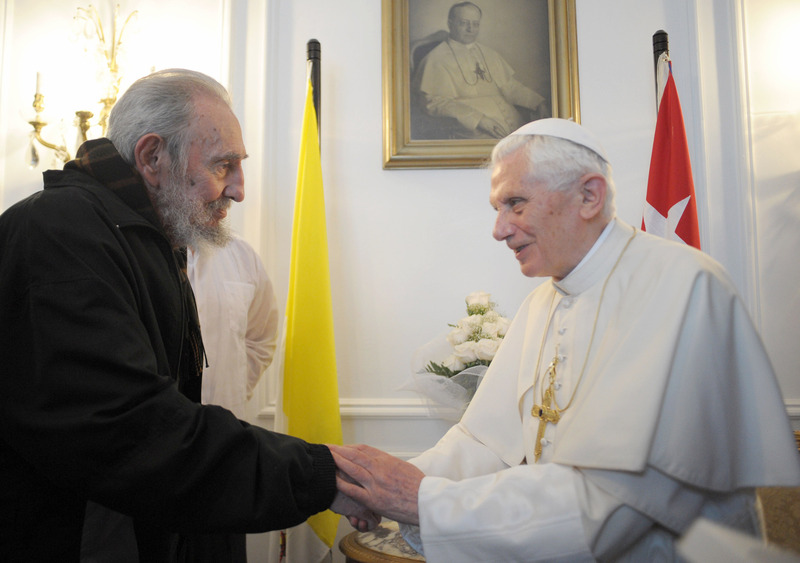 (CBS/AP) HAVANA - CBS Radio News correspondent Adrienne Bard reports Pope Benedict XVI met with Fidel Castro after saying mass in Havana on Wednesday. Benedict met for about half an hour with Castro, a Jesuit-educated altar boy-turned-revolutionary leader whose 1998 hosting of Pope John Paul II marked a turning point in the church's relations with Cuba. Earlier, Benedict demanded greater freedom for the Catholic Church in Cuba during Mass before hundreds of thousands of people in the shrine of the island's communist revolution, denouncing "fanaticism" that tries to impose its truth on others. Benedict's unusually politicized homily was a not-so-subtle jab at Cuba's government before a vast crowd in Revolution Plaza, but he also used plain language to urge an end to Cuba's isolation, a reference to the 50-year U.S. economic embargo and the inability of 11 American presidents and brothers Fidel and Raul Castro to forge peace. "Cuba and the world need change, but this will occur only if each one is in a position to seek the truth and chooses the way of love, sowing reconciliation and fraternity," he said. With the country's leadership listening from front-row seats, Benedict issued his strongest denunciation of religious intolerance yet in Cuba, referring to the Biblical account of how people persecuted by the Babylonian king "preferred to face death by fire rather than betray their conscience and their faith." He said people find freedom when they seek the truth that Christianity offers. "On the other hand there are those who wrongly interpret this search for the truth, leading them to irrationality and fanaticism; they close themselves up in 'their truth' and try to impose it on others," he said from the altar in the shadow of Cuba's revolution hero Ernesto "Che" Guevara. Benedict didn't cite the government by name, but later he urged Cuban authorities to let the church more freely preach its message and educate its young in the faith in schools and universities. "It must be said with joy that in Cuba steps have been taken to enable the church to carry out her essential mission of expressing her faith openly and publicly," he said. "Nonetheless this must continue forward" for the good of Cuban society. Cubans waving flags and banners large and small filled Revolution Plaza for the morning Mass, shielding themselves from the blistering sun with umbrellas as Benedict passed by in his white popemobile. President Raul Castro and leading Cabinet officials wore white, formal guayabera shirts, and Raul later climbed the steps to the altar and shook Benedict's hand. "Viva Cuba! Viva el Papa!" the announcers shouted. "The pope is something big for Cubans," said Carlos Herrera, a tourism worker who came to the plaza with his wife. "I come to hear his words, wise words for the Cuban people. That helps us. It gives us peace, it gives us unity. We do not want war." But others suggested they were here because they were told to attend by their employers in a country where mass shows of support for Fidel have long been a mainstay of his half-century revolution. The plaza holds 600,000 people and appeared nearly full, though many drifted off after registering their presence with teachers and employers. "We came with our class group and we are leaving because I can't handle any more," said a student who only gave his first name, Roberto, for fear he could get in trouble. "I came to do what my teacher said. I checked in, and I'm leaving." In the days leading up to the pope's visit, some Cubans had said they resented that the government was now telling them to attend the Mass, despite preaching atheism until the early 1990s, and remaining skeptical about the church's role in society. A huge poster of Cuba's patron saint, the Virgin of Charity of Cobre, covered the facade of one of the buildings facing the plaza near Che. The icon has been the spiritual focus of Benedict's three-day trip, timed to coincide with the 400th anniversary of the appearance of the diminutive statue. Benedict visited the statue in a sanctuary near the eastern city of Santiago on Tuesday morning and prayed to her for greater freedom and renewal for all Cubans -- another gentle nudge to the government to continue opening itself up to greater reforms. "I have entrusted to the Mother of God the future of your country, advancing along the ways of renewal and hope, for the greater good of all Cubans," the pope said. "I have also prayed to the Virgin for the needs of those who suffer, of those who are deprived of freedom, those who are separated from their loved ones or who are undergoing times of difficulty." A top official in Havana quickly responded: "In Cuba, there will not be political reform," said Marino Murillo, Cuba's economic czar. Before arriving on his trip to Mexico and Cuba, Benedict asserted that Marxism as it was originally conceived is irrelevant for today's reality. Upon arriving on Cuban soil, however, his language was less direct, and he pressed instead for the church to have a greater role in Cuban life and for Cuba's people to enjoy greater freedoms. The Vatican spokesman said the Holy See didn't take Murillo's comments as a rebuff to Benedict's call, noting that the pope isn't a political leader who can change laws or political systems. But he said Benedict does have some hopes for results from the visit. Ahead of the Mass, dissident blogs and Twitter accounts carried allegations that members of the Ladies in White opposition group had been prevented from attending, and that some opposition leaders were detained, reports that were reiterated by Amnesty International. It was impossible to reach any of the group's leading members on Wednesday. Elizardo Sanchez, who monitors human rights on the island and acts as a de facto spokesman for the opposition, said he could not confirm any detentions because his mobile phone hadn't worked since shortly after the pope arrived on Monday. It was an experience shared by many other islanders and foreign journalists who could not make calls on jammed lines. Another dissident, Hector Maseda said he has not been able to speak to any of the Ladies in White for the last three days. He showed visitors his home and cell phones, which were both out of service. The Ladies were allowed to march peacefully the day before the pope arrived, but dozens were arrested in a similar march the week before. During a nearly hour-long meeting Tuesday with Raul Castro -- twice the normal length of papal audiences with heads of state -- Benedict asked that the government declare a holiday for Good Friday, when Catholics commemorate the death of Christ. The request, like so much of this trip, was a follow-up of sorts to Cuba's decision to declare Christmas a national holiday in honor of John Paul's 1998 visit. Cubans hadn't had Christmas off for nearly 30 years. The government didn't give an immediate response. The date is not a holiday in the United States or much of Europe, including Italy or devoutly Catholic Poland, but is in many Latin American countries. Benedict also raised "humanitarian" issues with Raul Castro, an apparent reference to political prisoners. The Vatican spokesman, the Rev. Federico Lombardi, said he didn't know if individual cases were discussed. The island's Communist government never outlawed religion, but it expelled priests and closed religious schools after Fidel Castro came to power in 1959. Tensions eased in the early 1990s when the government removed references to atheism in the constitution and let believers of all faiths join the Communist Party. John Paul's 1998 visit further warmed relations. But despite years of lobbying, the church has virtually no access to state-run radio or television, is not allowed to administer schools and has not been granted permission to build new places of worship. Only about 10 percent of Cubans are practicing Catholics. "Naturally a papal visit hopes to be an impulse for further steps, be it for the life of the church or for the good of society in its entirety," Lombardi told reporters, citing media, education and health care as areas where the church wants a greater say.